By Sara A. Hunter, M.D., Brooke S. Lampl, D.O. An 8-year-old girl with autosomal recessive polycystic kidney disease (ARPKD) presented for routine follow-up. Renal ultrasound demonstrated enlarged, echogenic kidneys with lack of corticomedullary differentiation and innumerable small cysts (A and B. Corresponding CT examination demonstrated lobulated enlargement of the kidneys with poorly enhancing hypodense parenchyma (C). The liver and biliary system were normal. ARPKD is an inherited cystic renal disease, occurring in approximately 1:20,000 births, relating to a mutation of the polycystic kidney and hepatic disease 1 (PKHD1) gene on chromosome 6p. Pathologic findings are characterized by nonobstructive, symmetric renal collecting system ectasia with interstitial fibrosis. Patients most commonly present in the perinatal period with respiratory distress from pulmonary hypoplasia and/or renal insufficiency.1,2 Our patient initially presented at 4 years of age with multiple urinary tract infections and abdominal masses palpated on physical exam (corresponding to enlarged kidneys). Treatment is primarily supportive with control of portal hypertension. Some patients require hepatic and/or renal transplantation. Overall prognosis is variable, depending on the severity of the renal disease, with the worst prognosis in the perinatal form. Lonergan GJ, Rice RR, Suarez ES. 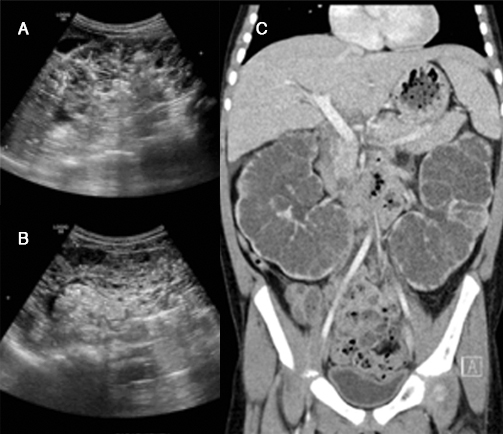 Autosomal recessive polycystic kidney disease: radiologic-pathologic correlation. Radiographics 2000;20(3):837-855. Dillman JR, Darge K. Congenital and neonatal abnormalities: prenatal imaging and intervention, genitourinary system. In: Coley B. Caffey’s Pediatric Diagnostic Imaging, 13th ed. Philadelphia, PA: Elsevier; 2018:1097-1098. Hunter SA, Lampl BS. JAOCR at the Viewbox: Autosomal Recessive Polycystic Kidney Disease (ARPKD). J Am Osteopath Coll Radiol. 2019;8(1):19. Sara A. Hunter, M.D., Brooke S. Lampl, D.O. Dr. Hunter and Dr. Lampl work with the Division of Pediatric Radiology, Imaging Institute, Cleveland Clinic Foundation, Cleveland, OH.